1/31/2019 Well, now, welcome, delicious, welcome! This new ES really sounds interesting and it's nice to see some action involving our academic factions. But may I ask where's Absintheuse? 1/31/2019 Manning the Sunless Skies fort. This is a *very* big day for us. 1/31/2019 Wonderful story so far - I bought two extra candles. Lovely writing. I am a bit worried I am not timing my choices right, but we will only know at the end, I suppose. Or ready for some other things! 1/31/2019 I've unlocked this but haven't started it yet-- just wanted to say that I saw the phrase "Grab a bat", and then realized-- once cricket was mentioned (since in the game that comes later in the description)-- 'oh, that kind of bat.' Though who knows, maybe cricket's evolved a bit since the Fall. "How would you like to be our cricket player?" "Because! Now off you go, it's time for the game!" "I do not want to do this. I literally tried to punch out your missing player earlier today. I have no reason to be invested in your team's victory, and based on the available facts I know you and your rival as a bunch of busybodies annoyed a woman who was supposed to win your game of cricket for you has gone mad"
"I'm counting on you! I've got a real good feeling about you!" "I'm going to toast to myself"
"Ah, hello sir. Yes you, an ostensibly unqualified citizen, have caught the police rummaging through your private property. I will neither summon heavily armed, thuggish reinforcements as is the stereotype for constables nor attempt to make this offer sound anymore appealing or unique as an opportunity than civic duty dictates. But would you, unqualified citizen, like to commit espionage on our behalf? Espionage is fun, all the cool kids are doing it! It's so much fun I clearly did not think mine through before breaking into your house!" "Have a nice evening, sir"
"Hello, I am a devil. I'm going to teach you cricket now"
"...I appear to be experiencing physical wounds. Why is this happening. This is not supposed to be a full contact sport"
That I am deeply, deeply unsure about how I got involved or why I should be invested in the ongoing events. I'm probably just going to hit Blemmigans the whole game, whatever the Correspondence scribblings in whatsherface's room turn out to be about. 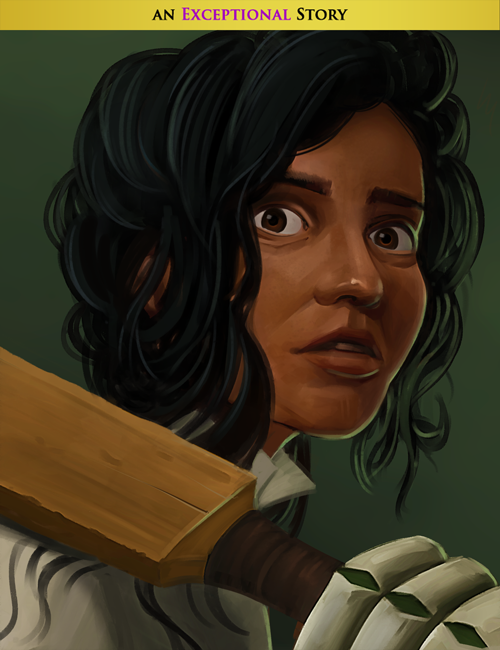 I've unlocked this but haven't started it yet-- just wanted to say that I saw the phrase "Grab a bat", and then realized-- once cricket was mentioned (since in the game that comes later in the description)-- 'oh, that kind of bat.' Though who knows, maybe cricket's evolved a bit since the Fall. Where are my sodding crickets? Cricket and Bats go together like a different type of crickets and a different type of bats. Either way, crunching and cracking. I assume so, anyways. Not a lot of first-hand experience, or even second-hand. Now I understand how the rest of the world feels about the celebrations we're preparing for the gridiron hand-egg final on Sunday. 1/31/2019 I absolutely loved this one. The structure, the pacing, and the sense of place are excellent. It's no surprise that Chandler is also an Inform author — the way that the story requires you to explore and retrace your steps feels very Inform-like. I enjoyed the match, as well as what happened afterwards. 1/31/2019 I'm afraid the Benthic college team will be terribly let down by me; All I want to do is get drunk and throw blemmigans at people. I'm afraid the Benthic college team will be terribly let down by me; All I want to do is get drunk and throw blemmigans at people. 1/31/2019 Loved it to the end - especially the end. -FINALLY, FINALLY I got to use Courier's footrpint in a story and it was worth. every. action. of the grind. When we complain that Poet Laureate and Courier's Fooprint is not celebrated enough at the end of the grind... this is the culmination to look for. I wish it wasn't locked behind a Fate story, but I am happy I finally got to have it. -This was London at its most alive: sporting events, factions, fun, a view of the whole city, things you did mentioned casually, visitors from India, bats all over the place, librarians, blemmigans going around. I think it was the first time that, instead of focusing on a single Thing (like rubberies, or servants, or zee travel), you felt like someone who has partaken of everyhting that London has to offer and brought a bit of everything to the table. The city felt whole, and your character felt complete. No small feat on behalf of the writer. -Loved the zero actions it took to wander around the game. The opposite would have been crushing, but this felt just right. -Loved that we got to use Wings-of-Thunder and even the Bat with Attitude for those of us who had one. -I would have preferred an explanation of why Benthic chose me; I mean, just the fact I expertly avoided the (wooden) bat swinging for my face would have been reason enough. Not to mention everything else that happened with me at the center, including the epilogue. As a Paramount Presence I can see why Jolanda was at the epicenter of all this, but for someone at the beginning of their FL career, a minor excuse would work better than 'it just has to be you' - even if certain qualities allowed for a different explanation later on. -The Broken Word is MINE. I am not giving it away, and I would love to know why would anyone do that. Having said that... Renown is supposed to be the one quality that never goes down. I can see how choosing to keep the item in question would cost you all your favors with either faction, or some Connected: Masters... but renown with them should increase, not decrease (which should never happen anyway, in my opinion). -Did I say the word is MINE? And mine alone? Having said that... Renown is supposed to be the one quality that never goes down. I can see how choosing to keep the item in question would cost you all your favors with either faction, or some Connected: Masters... but renown with them should increase, not decrease (which should never happen anyway, in my opinion). 1/31/2019 The only thing missing from this story is the ability to use Mr. Pages’ Christmas gift as a bat. Oh, and some of my memories. 1/31/2019 Out of curiosity, which Faction(s) sees a Renown decrease? 1/31/2019 This ES is amazing. It is probably the most well written ES for quite a while, and it's mechanically amazing as well. Everything ties in together, rarely used qualities and items get a chance to play, and it reveals/confirms a little more of the deep lore. I aboslutely loved it, and am proud to keep my new BiS weapon. A Correspondent of measure and restraint, not-withstanding a tendancy to rush into things. Northwards with Noman. At least they'll have company. 2/1/2019 Having just finished the story, the detail involved was splendid, with the story fully taking advantage of the richness of the setting. Many times an ES, even a good ES, feels very isolated in its existence. Good ESs take advantage of this and build off of that isolation, typically ones involving boat trips or other travels (12:15 to Hell and Lost in Reflections are other examples). Bad ESs are typically a slight too mundane, and so you have nothing to distract from the railed nature of the story. The potential renown drop at the end (you prob. know where) is really perturbing because renown isn't meant to work like Connected did, but I will say the ending was superb overall, and I at least I finally got to use SotC 21. When the strange things come a-knocking, hire someone Stranger.